Devices are available for Serial, Ethernet , CAN and HART, with a wide range of supporting options. A range of protocol converters and gateway units to enable simple communication between different Fieldbus protocols, such as Profibus, BACnet, HART and Modbus. A wide range of CAN-Bus Converters, Repeaters & Gateways (including CAN-Open and DeviceNet protocols). Ethernet to Serial converters allow Serial devices (RS232 / RS485 / RS422) to be connected to a standard Ethernet LAN. Industrial Ethernet Switches including Unmanaged Multiport Switches, Fibre Optic Ethernet switches and Redundant Ring Ethernet Switches. 2.4 Ghz Wireless modems for cable free Data Acquisition and GPRS/SMS Modem for communicating with remote systems/dataloggers. 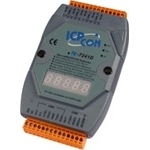 Range of Hart Converters to provide a bridge between HART controllers and a Modbus network. ZigBee Modems designed to offer Wireless Data Transfer in the Industrial Environment. Supports network redundancy. A range of PCI (and Universal PCI) Multiport Serial Cards offering extra serial ports in either RS232, RS422 or RS485 format.